Service Costs > How Much Does 1-800-GOT-JUNK Cost? How Much Does 1-800-GOT-JUNK Cost? 1-800-GOT-JUNK, a full-service junk removal service, will haul away just about anything you do not need any more right at your door. To use, the company simply asks that you either call their toll-free number direct or fill out the form online to receive a no-obligation quote in as little as a few hours. According to the official website, 1-800-GOT-JUNK states that its pricing system is “simple and straightforward” and to schedule a no-obligation, in-person price quote, they ask that you click the schedule now button and fill out the appropriate information. While the online schedule does not give you a quote, it simply sets up an appointment where a 1-800-GOT-JUNK employee shows up at your door to offer you a no-obligation quote in person. Even though the official website does not offer exact pricing, we were able to find to find estimates online from previous customers who used them, and like most junk haul away services, the quotes would greatly depend on your geographical location, the amount of junk you need hauled and what kind of junk you have as a refrigerator would cost more than a few large pieces of furniture. Based on all of these factors, we found that the company tends to have a minimum around $140, regardless of how much you have, with quotes as high as $900+ to load up the entire truck. The quote you receive on the job will be the all-inclusive quote, with no hidden fees, to haul away any of the junk you point out at the job site. You can refer to our price chart below for all of the quotes we sourced online. On one Yelp review for the Long Beach, California location, a reviewer noted she was quoted $129 for a mattress and a storage cargo for a car, whereas another reviewer on that same thread was quoted $35 for a refrigerator, but when they showed up, the quote increased to $129. Carrie at BrickCityLove.com did a great job taking pictures of the debris she had 1-800-GOT-JUNK haul away from a recent renovation, and according to her post, she paid a grand total of $362, which filled up about 3/8ths of the truck. How much of the truck are you taking up? NOTE: The trucks, as per the official FAQ page, are 10 feet long, 8 feet wide and 5 feet high. To picture this, the back can fit eight, full-sized, stand-up refrigerators. Anything shredded? From what we read online, if you need anything shredded, they charge close to $15+ per banker box size. Moving items to the curb? They highly recommend you place all of the junk you need to be removed at the curb, but if you cannot do so, they will charge additional fees in terms of the labor involved in the job. 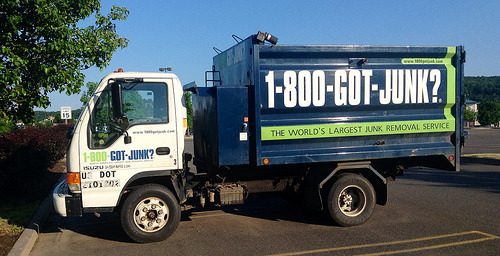 All 1-800-GOT-JUNK operators are franchised owned, simply meaning you’re dealing with a local franchisee. The company cannot take away any toxic materials, as per their FAQ, such as paints, chemicals, oils, asbestos, oil drums, oil storage tanks and junk vehicles. Every truck, owner and team member are fully licensed and insured, all bound to the local laws. Promo codes and/or coupons are occasionally available if you search online or even browse your local location Yelp page, for instance. At the time of this publishing, for example, we found a $10 off coupon if you booked a truck online. What a rip off! My son needed some junk removed in his garage and was about equivalent to 20 garbage bags. I should have rented a truck and did it myself. Felt ripped off!!! I was hesitant when I read the reviews online but I had a TON of stuff and when I say TON, I mean it. I called up a local location and found out the owner, who owned it as a franchisee, simply said he would charge $500 maximum to fill up the entire truck. I felt it was actually worth it by the time I did the labor, rented a truck, etc. I didn’t lift a finger.. it was great. I was quoted $139 over the phone which seemed to be the minimum but when they arrived to my driveway, the guy said it would probably be more than $325. What??? I sent them on their way.. no thanks. I had a mattress, a few computer monitors and a few bags and while I thought the price was okay, they didn’t contact me upon arrival. I just wish they communicated a pinch better. I was quoted $500 but I ended up using the Bagster by Waste Management. It’s a premium for a reason people. A premium price with a premium job well done. I really pointed and they removed the junk. The price is related to the “space” required to haul it away, that (IMHO) is open for interpretation. The two man team treated the junk better than most movers that I’ve seen handle your new property.